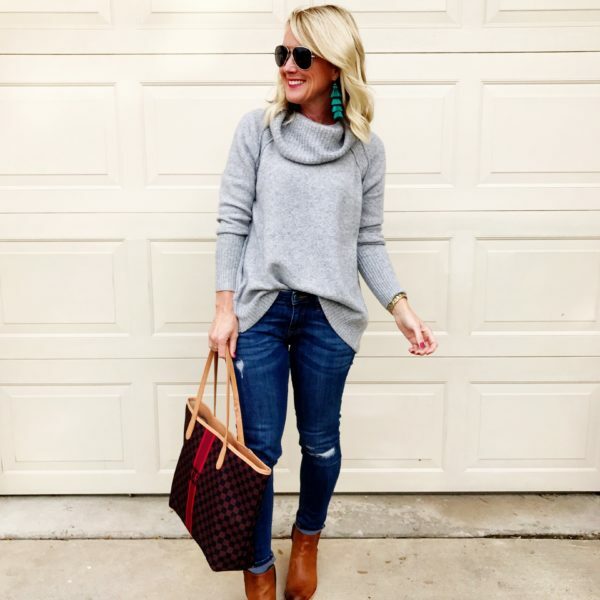 8 Darling Sweaters Under $40! | hi Sugarplum! Merry Thursday, friends! Are you recovered from the holiday rounds, or still moving slowly? I love the day after Christmas…a lot of laying around, eating leftovers, and having fun with the new gifts. The magic of the holiday still lingers, but with a more peaceful pace than the days prior. In the UK and other countries, the day after Christmas is called ‘Boxing Day’, and is an actual national holiday! Banks and offices are closed, and it’s the start of major sales. 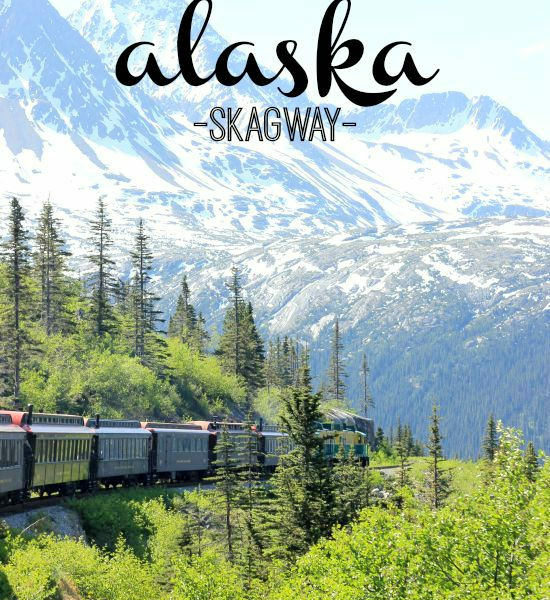 I can get on-board with that, how about you?! One of my new retailer crushes, Marks & Spencer, just marked tons of items 50% off in celebration of Boxing Day! I first discovered them on our trip through the British Isles, and was excited to hear y’all were long-tine fans of the brand, too. I found some of my best gifts and stocking stuffers there this season…like this table tennis set, phone projector, and kazoo game. 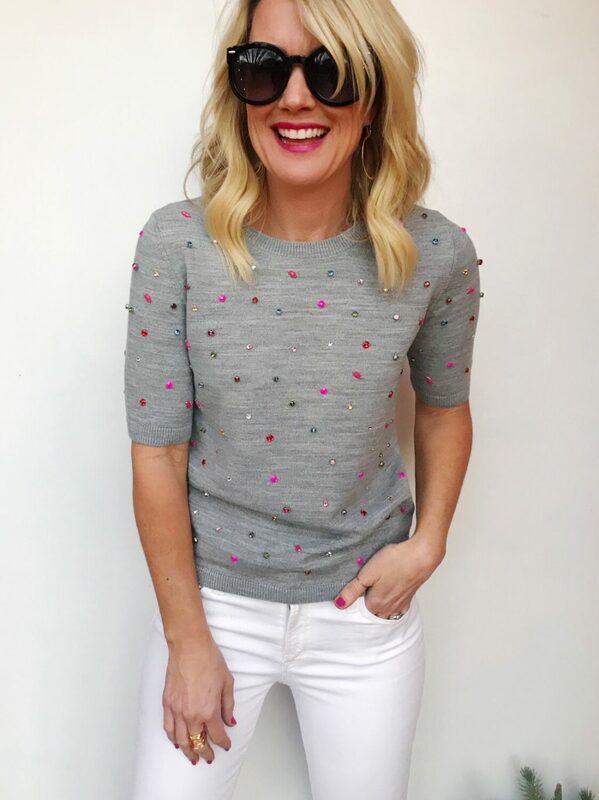 How fun is this embellished sweater? 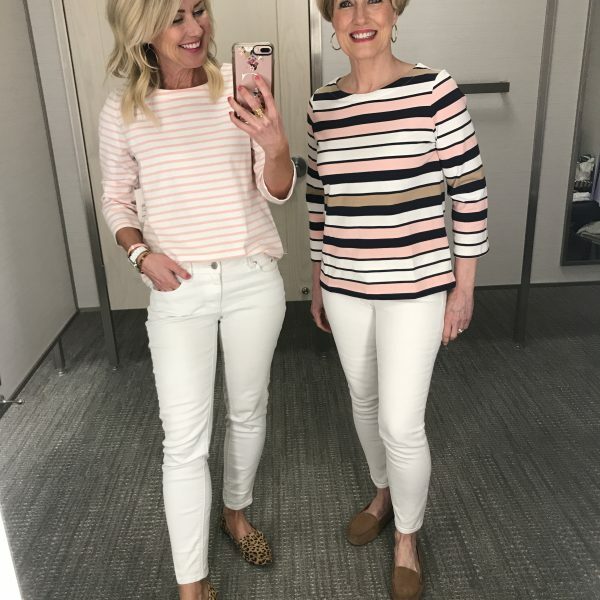 I love the longer sleeves and close fit…so cute with trousers and skirts, too. It comes in three colors and the jewels are well-made and firmly-attached. Fit Tip: I’m wearing a US4, but it’s a tad tight in the arms and would prefer a US6. 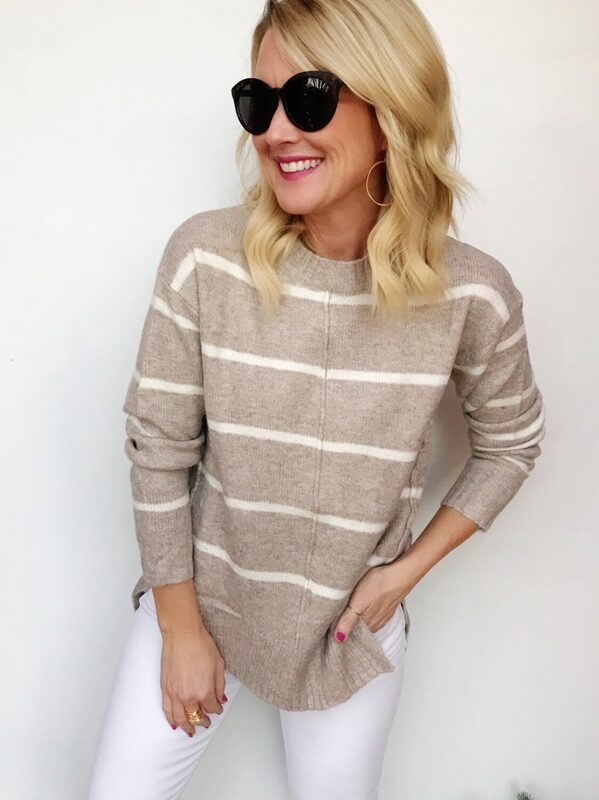 This striped pullover is cozy and soft…I paired it with dark jeans and loafers for an easy Christmas Day outfit. It has a slight high-low hem, and cut side-slits for a relaxed fit. 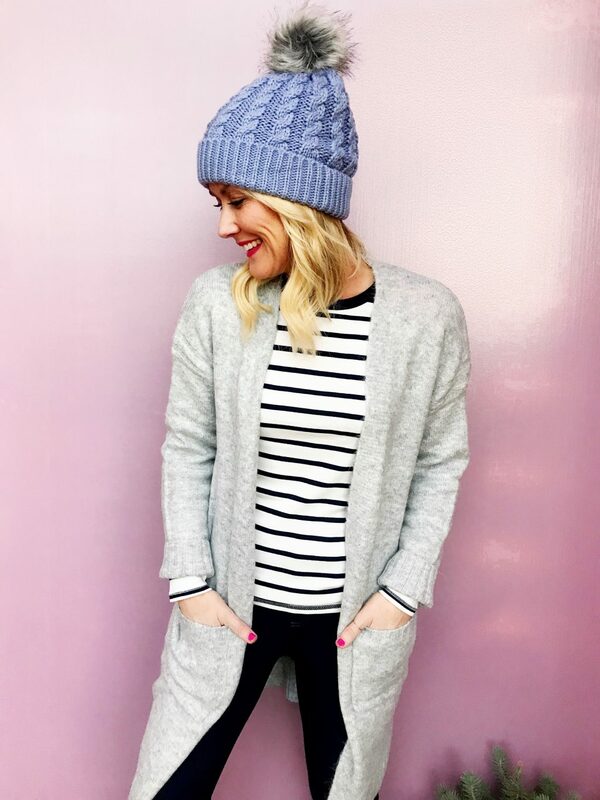 Long cardigans are great for pairing with jeans, leggings, and over dresses, and this one is a steal at $40! It’s soft and chic, with front pockets, and comes in several colors. I paired it with this thick striped tee for only $8! Fit Tip: I’m wearing a small cardigan, and US6 tee. This faux-fur v-neck sweater is so fun and festive, but soft and comfy, too. The color is a gorgeous, vibrant pink (also comes in ivory), and easily dresses up with skirts or trousers. It’s an unbelievable deal at only $31. And the Marks & Spencer pom-pom beanie has quickly become one of my faves, and I have several colors. 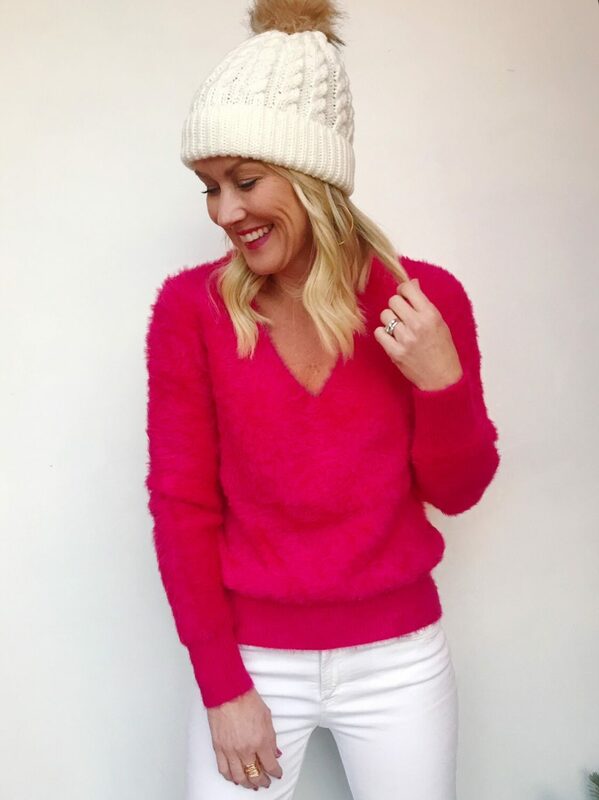 How can I resist a cozy sweater in vibrant shades of pink?! This popular option goes in and out of stock frequently, and for good reason. It’s a little boxy and oversized, with a slight mock neck. Fit Tip: I’m wearing a medium, but would prefer a small. 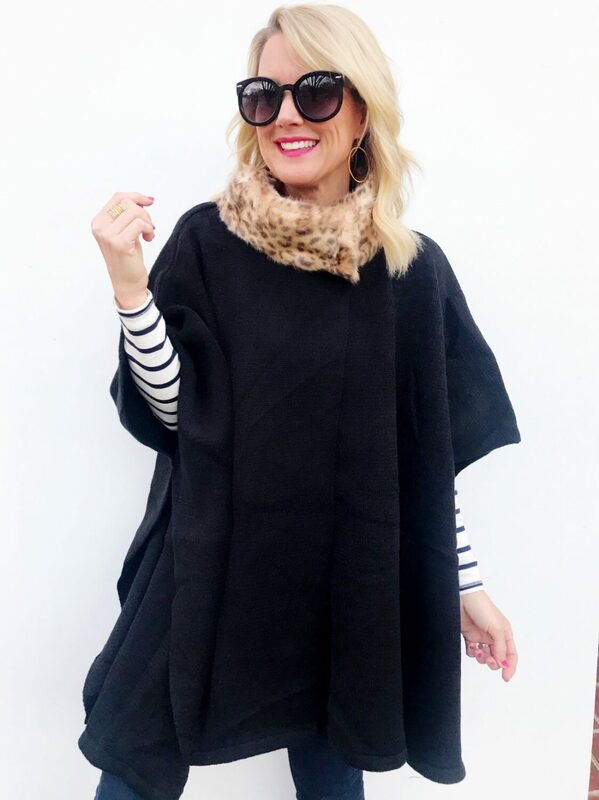 This sweater knit poncho is so chic with a tall leopard collar and soft body. Wear it casually over a long-sleeve tee, or layer it over dressier styles for extra warmth and style. 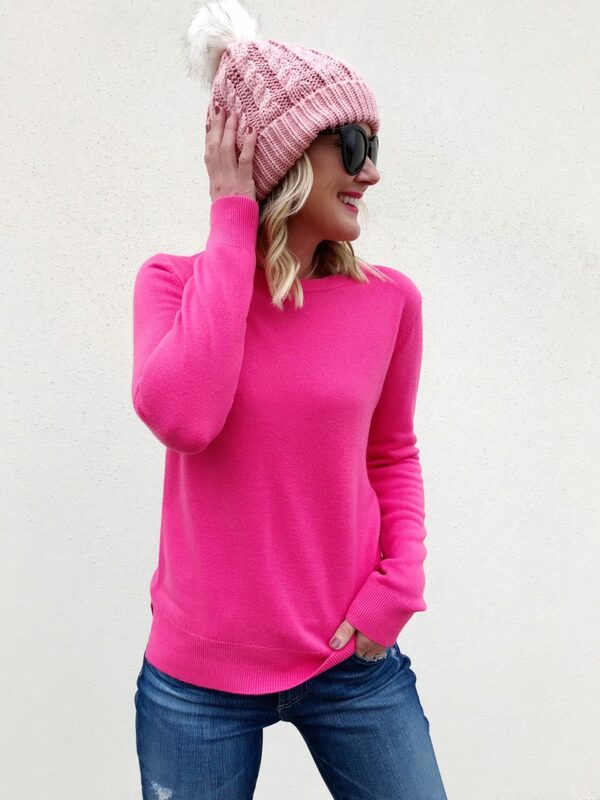 This basic crewneck sweater comes in a ton of colors and only $11!! Wear it alone, or layered under jackets and over collared shirts. 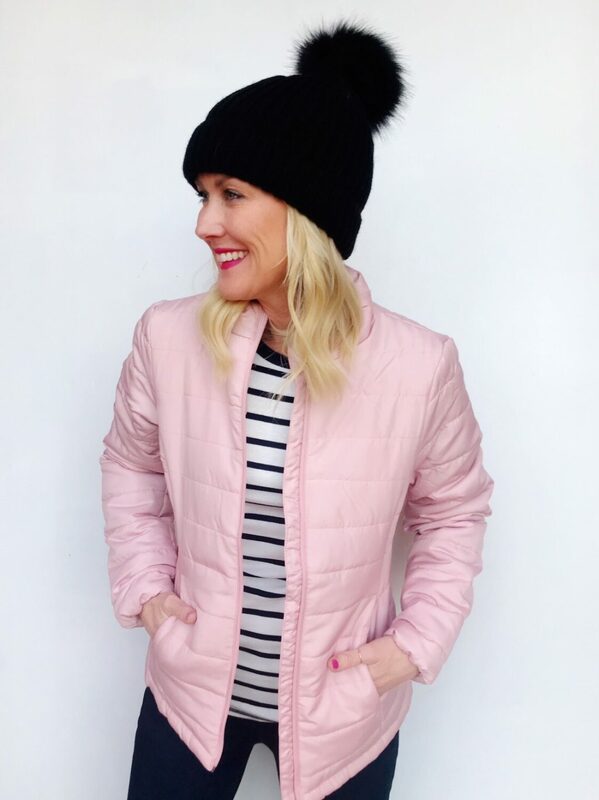 And finally, the cutest puffer jacket for only $40. It comes in five colors, but obviously I’m a sucker for the pink. It’s fitted and lightweight, without adding any bulk. Which is your fave from this round of affordable sweaters (or ‘jumpers’ as the Brits call them!). 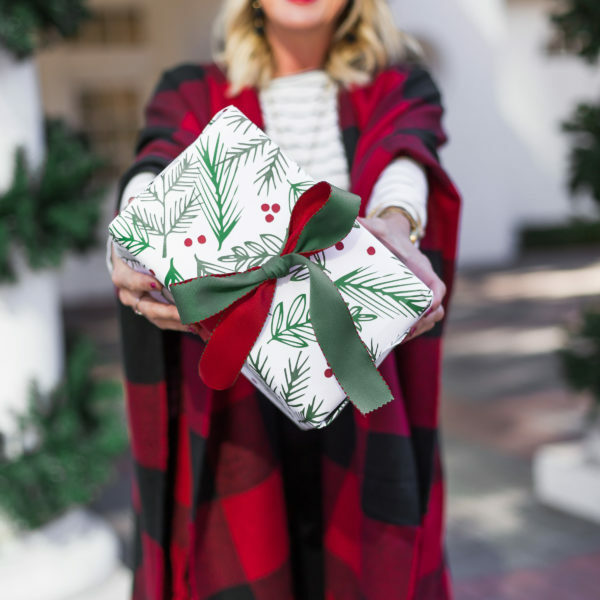 I just ordered this olive wreath for only $16, and these cute table top trees and Christmas tea towels are now 50% off! And don’t get me started on these darling dresses for little girls!! Do you celebrate Boxing Day where you live? What are your favorite things to shop for at Marks & Spencer? 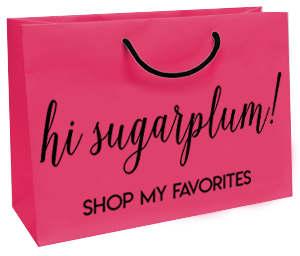 I love hearing all the fun ways you shop this new-to-me brand!! See my other posts with Marks & Spencer here and here, including amazing lace dresses under $100! I just love all of your posts! I look forward to them each morning while I drink my coffee and the children are still in bed! I had not heard of Marks and Spencer before until you featured them a few weeks ago and absolutely love the style and prices! I received the leopard sweater for Christmas that you modeled with the hot pink trim at the waist and love it!! Thanks for sharing this awesome brand with us! I hope you had a Merry Christmas and Happy New Year! Thank you so much, Summer!! 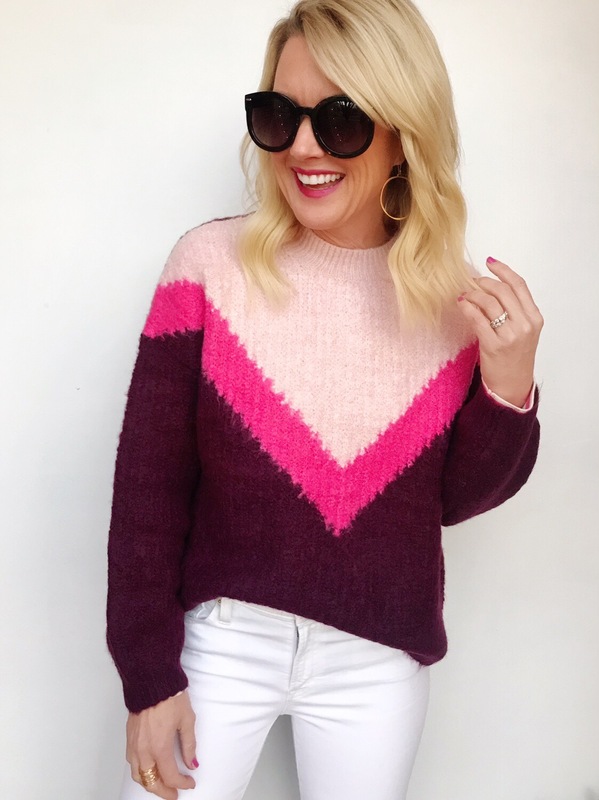 I’m thrilled you loved the sweater and found a new fave retailer!! Happy New Year! Hey Cassie- Do the shipping prices apply to shipping to the US? If so, what are the shipping times? Yes, it’s free shipping with a $50 purchase and it arrives via DHL within 3-5 days!! Boxing Day is the day historically that employers give ‘boxes’ to their employees of food etc. Think of Dickens’ A Christmas Carol. It’s a bit like Black Friday in that it used to be the day sales started, but now the Boxing Day sales start before Christmas! M&S is known for their great inexpensive knickers! Wish I found you earlier as I LOVE your post’s. Really wanted that leopard sweater from M&S, but it probably sold out within days of your post. 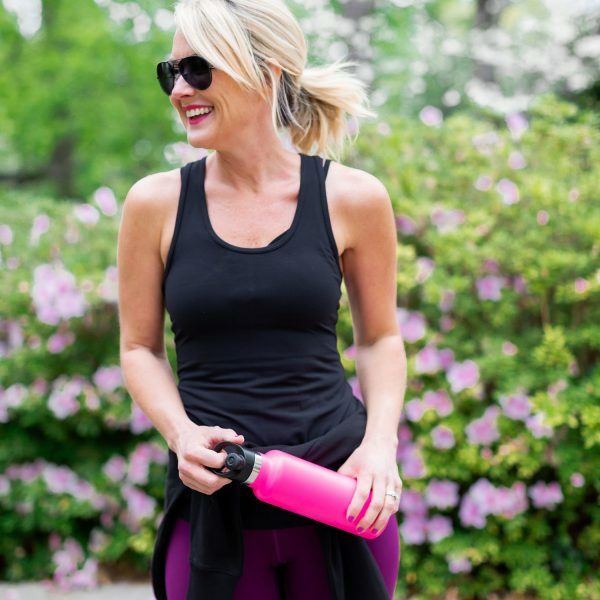 I just recently found you through another blogger friend (thefancyashley). Keep up the GREAT work! Hello Cassie from Colorado! I’m trying to order from Mark and Spencer but the 20% click isn’t working on the post! Is there a code to get the 20% off? Enjoy Mexico!